The Masterpiece: the VOLCANO DIGIT digital vaporizer. Free Space Case Grinder & Free UPS Shipping (cont US only) w/every Volcano Vaporizer. The Volcano Digit vaporizer features an extra large LED display that immediately and precisely informs the user of the operating status. It is equipped with the new innovative EASY VALVE Starter Set, which features an optimized filling chamber. Valve balloons and mouthpieces are maintenance-free and always connected ready to use. 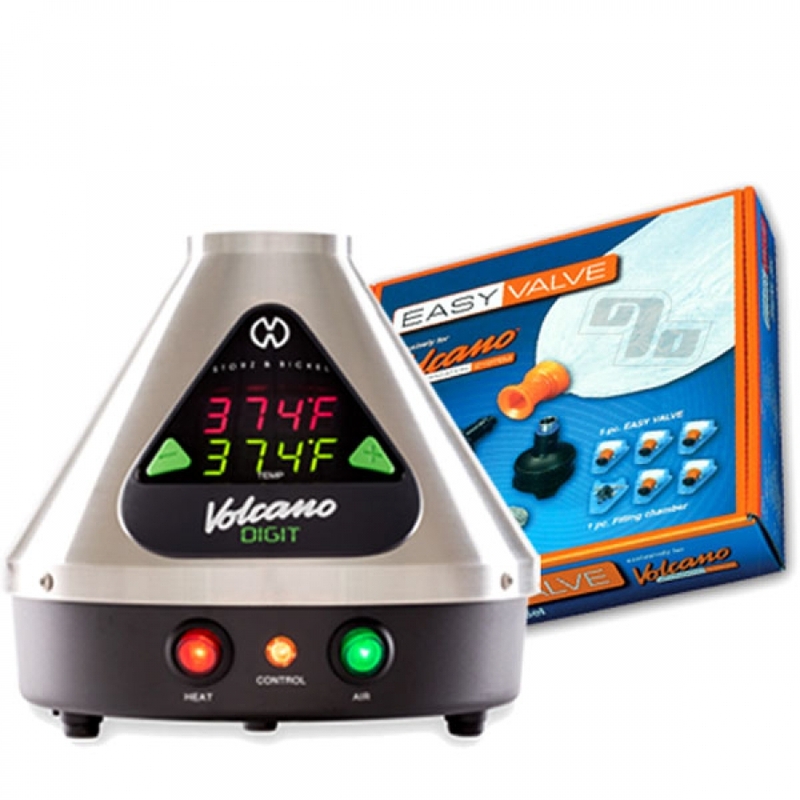 The Volcano Vaporizer releases the active ingredients and flavors from herbs through vaporization by hot air (convection). Optimum vaporization of the active ingredients reduces the development of carcinogens and odors to a minimum. This means that even non-smokers find the vaporizer enjoyable and non-irritating. 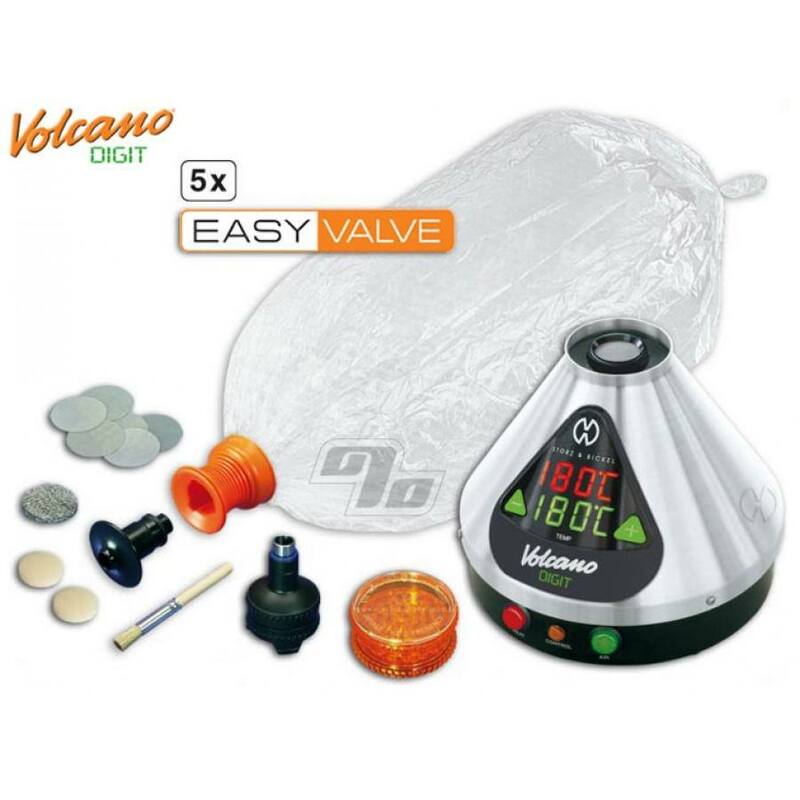 The unique patented Volcano vaporizer technology fills the included balloon with air enriched with the active ingredients and herb flavoring. This takes place via a valve which is then separated from the device and is portable. This means that the active ingredients can be savored at ease, both comfortably and safely away from any hot or heavy items. The Volcano Digit has been renowned as the most technically advanced and professional vaporizer available for a very long time. The precise and reliable air temperature control of the Volcano Digital Vaporizer sets the gold standard for true medical grade vaporizers. This one is actually certified and not just marketing. Stringent selection of material, impeccable processing and practical in its form, the Volcano vaporizer combines simplicity of use, a high degree of safety and excellent efficiency. Reliable technology; "Designed and Manufactured in Germany for the highest quality and durability. Backed by a Three Year manufacturers warranty. This item can only ship to the address listed on your credit card account -or- can be paid for in advance with check or money order. Discounts not applicable on Volcano products as per manufacturer requirements. please call or contact us if you have any questions. Wow Wow Wow! Love my Volcano! This volcano digital is not only the best vaporizer I've ever used but probably the nicest item I have ever owned! So beautiful, works perfectly and everyone who tries it falls in love... my space is the new party spot ;-) THanks 1 Percent!